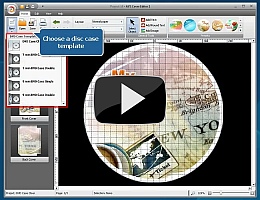 AVS Cover Editor is a compact and fully functional application that lets the user create different labels for optical discs and box covers, edit them and print or save into graphical files. You can use AVS Cover Editor together with all the other AVS4YOU products or as a separate application. save your created labels and covers into an image file if you do not have a possibility to print them right now. The program does not require any specific knowledge but at the same time has extended editing capabilities that will let you create labels and covers to your taste and needs. Using AVS Cover Editor you can add a touch of individuality to your optical discs collection and label them so that you could find the necessary discs faster. To start AVS Cover Editor go to Start menu and choose All Programs -> AVS4YOU -> Burning -> AVS Cover Editor. What is in AVS Cover Editor?